Alcon (formerly CIBA VISION) AIR OPTIX NIGHT & DAY® AQUA Contact Lenses (6 pack) - a monthly disposable contact lens that delivers exceptional vision and outstanding comfort and health. These contact lenses are designed to work around the clock to keep up with you and your busy lifestyle. With the highest oxygen transmissibility of any available soft contact lens they provide comfort day after day and even overnight. 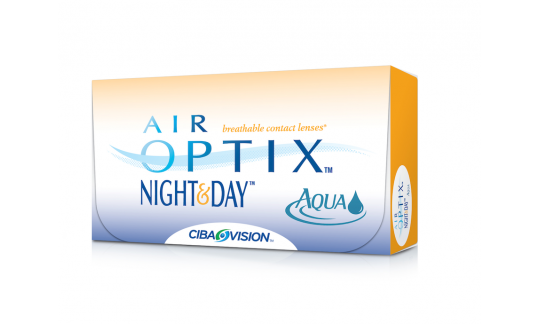 Air Optix Night & Day Aqua are approved for daily wear and extended wear for up to 30 nights of continuous wear. NB: The AIR OPTIX NIGHT & DAY® AQUA replaces the superseded FOCUS NIGHT & DAY®. Ciba Vision have exhanced this lens by adding a handling tint and the AQUA Moisture System. They are made from the same silicone hydrogel material, lotrafilicon.